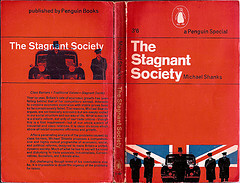 Many years ago I remember seeing a book entitled “The Stagnant Society” which was about the relative decline and low growth rate of the UK. As a result living standards rose more slowly than the more dynamic European economies. There were both economic explanations (a lack of investment) as well as the harder to quantify sociological ones (a rigid class structure which led to both a poorly equipped educational system and a general disdain for manufacturing and trade). In 2009 the government changed the definition of full-time employment from 30 hours or more per week to 35 hours. This would have provided an immediate uplift to statistics as a section of lower-earning workers was moved from being classified as full-time to part-time employment. The number of residents (citizens and permanent residents) increased by 7% over the period 2006 to 2010. If the incomes of new citizens were considerably higher than the median then the median would have risen but there may have been a smaller change in the median incomes of the original Singaporeans. MOM use the CPIto calculate the rise in real incomes over this period. However as Secretary General of the RP I had already expressed serious doubts over whether the current method of calculating CPI accurately tracks housing costs. These take up more of the expenditure of lower and median incomes (around 25%) than they do of higher income groups (http://www.singstat.gov.sg/news/news/cpi-jul-dec2008.pdf). The Statistics Department bases its calculation of housing costs on imputed rentals. The Statistics Department’s method of calculation fails to capture the rise in mortgage servicing costs which will be driven by rising prices (HDB Resale Price Index up 70% over ten years). Nor does it capture the depreciation in HDB properties which are only 99 year leaseholds. The rental sector is very small and most Singaporeans have to buy. While rents have fallen over the last few years in line with interest rates the HDB resale price index has continued to rise strongly. Also is the fact that average flat sizes have decreased reflected in the CPI? This is an example of so-called hedonic indices which attempt to track changes in quality of the goods in the basket and reflect these. The lower income groups also spend more of their incomes on food and utilities, the costs of which have risen faster than the general index in the last few years. The report goes on to say that median monthly income per household member among citizen headed employed households increased by 1.8% p.a. in real terms over the same period. This is a measure that MOM appears to have trotted out specially. However this has even more problems than the first measure. The number of dependents per household has been falling as a consequence of Singapore’s declining birth rate. So income per household member would rise even without any rise in median real incomes. Even if the MOM’s statistics are accepted at face value there would appear to have been little real income growth for the majority of Singaporeans. However given the caveats above the picture is undoubtedly worse than it appears. While I would not contend that Singapore is unique in having these problems, the fact is that we have a government which trades purely on its record for delivering the goods economically. That after all is why we are told we need to put up with the lack of personal and political freedom. The government has set itself an ambitious target of 30% median real income growth by 2020. That seems like pure pie-in-the-sky now given the state of the global economy. By 2016 I see the electorate being less forgiving than they were in 2011. Who knows? By 2016 Singaporeans may be much closer to putting a non-PAP government in office for the first time. Singapore has been a stagnant society for many years , not just recently . Policies were confused from the beginning , early on only allowing 2 children , then when the birthrate fell , allowing foreigners in without worrying about integration .